is it me or do the seats look like they are positioned to close to the tunnel? ...as for the seats, at present they are copies of the GMP '67-'69 Trans Am Camaro fitment produced for my creation of a two-piece urethane mold to suite the purpose. 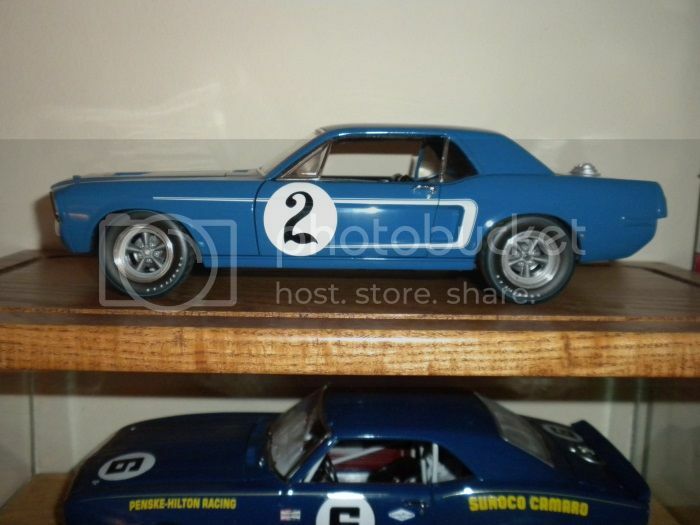 I haven't much to choose from here given most period 1:18th scale seats road racing seats are sourced from Shelby GT 350R's and the like, whereas I vaguely hope that the new ACME Trans Am 'Cudas and Challengers might offer up something more accurate. Surely I need to work on the seat mounts and come up with the AAR 'Cuda seat support structure extending back to the roll hoop cross bar, etc. above and beyond what I've done to date. Mike - I couldn't agree with you more on the offerings coming from ACME/Greenlight. They carry on the tradition of the "tribute" '67 Mustangs, which , with very little work, could have replicated the Shelby Trans Am Mustangs. 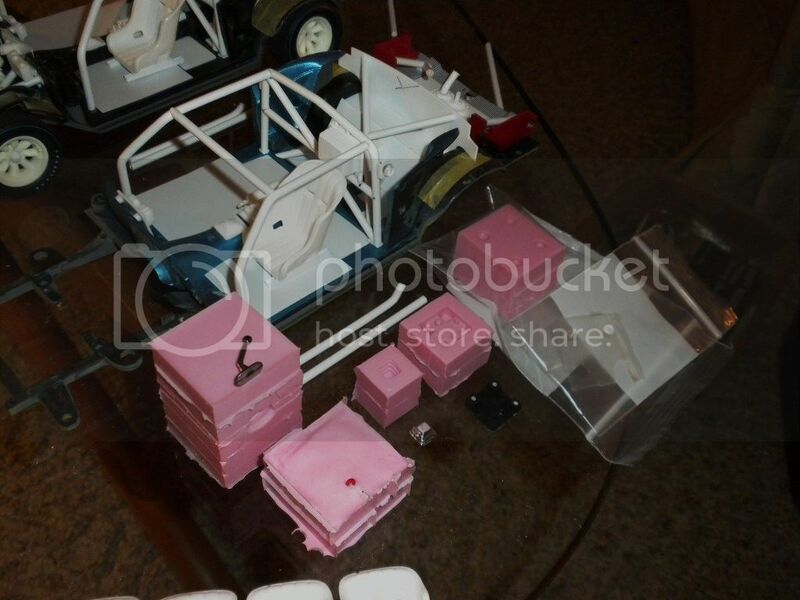 The lack of simplistic details such as roll cages, fuel cells, and other racing details renders the Greenlight models no more than door stops. 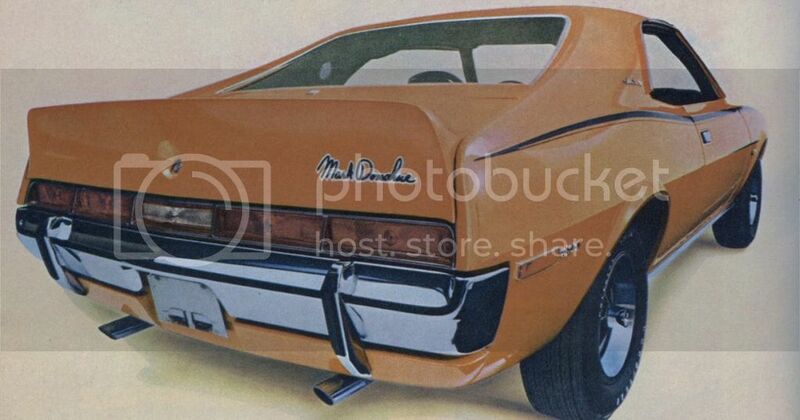 I am afraid that the forthcoming Barracuda and Challenger "clones" will be equally disappointing. However, the unknowing and misinformed will buy them, place them on shelves, and be very proud of owning nothing more than a mockery. You, however, My Friend, continue your commitment to an accurate, yet labor-intensive, replication of these iconic racers, and I applaud your efforts. Wow... those are really poor. I especially like how they have the exhaust systems switched from car to car. No front spoilers? Here are some photos I took of the Challenger seat mount a number of years ago. A few more, plus one of my daughter sitting in the car. Mike (Swede70), you are doing fantastic work on all your models, takes infinite talent, patience, and a lot of time to do the work you do, and correct ! Question for you, I found this photo, taken at NNL West in 2016, on the net, Bob Tullius '66 Dodge Dart. is this 1/8th ? or another scale. I don't recall this model in period, Maybe AMT did it ? has it been done by any Resin casters ?. significant car ! 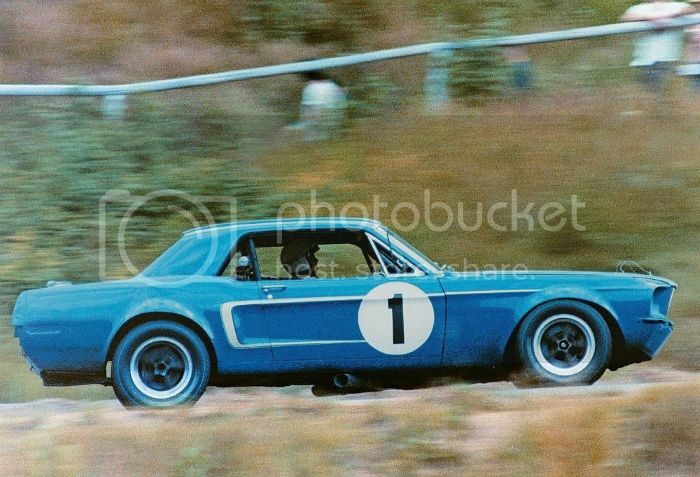 Tullius and Adamowicz won the first Trans-Am race with it at Sebring in 1966. I go to that show every year. These were all 1/25th scale. This is a resin body offered by a vendor. Their theme for that year was Trans Am. Oh my - where to start? Thank you very much Jon for the definitive sweep of Challenger seat installation photographs which will help my efforts immensely. I've poured a few extra seats to afford patch material to reposition the seat belt pass through holes, while I'm contemplating just how to better capture the upholstery detail stretching around the seat shell proper. 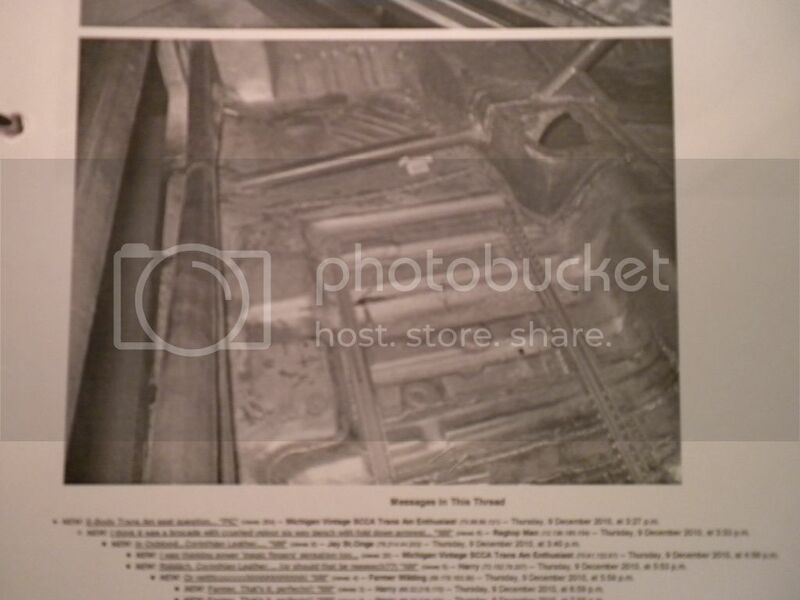 Plastic coated wire will likely be employed for the structural seat lattice work, whereas your photos again will certainly be employed to better master the mounting hardware that has been fabricated up until now. I hope the Munchkin Mrk. I. seen seated inside the 1:1 #77 is doing well! Indeed, with the 50th Anniversary of the old Can Am as well as the Trans Am arriving on the calendar a good many regional contest were so-themed or so sub-themed. Although there has always been a solid flow of high quality work done by various individuals across scales that is '66-'72 SCCA Trans Am themed, the increasing visibility of the old Trans Am combined with the arrival of new tools and occasional resin releases of note has seen more enthusiasts create such replicas. 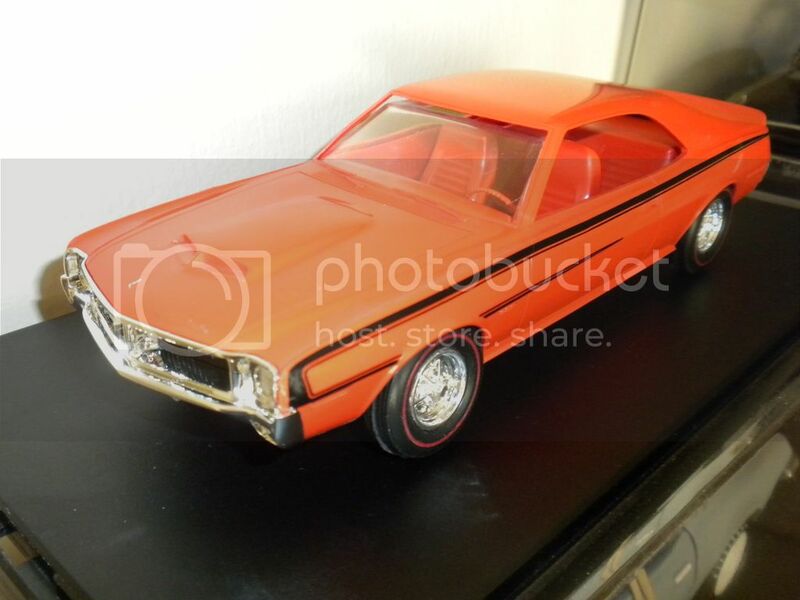 The Group 44 Dart seen in the above post looks quite nice - thanks for bringing our collective attention to it. Perhaps in time I will be able to find the same resin Dart. ...and a mild update of sorts. Given that I haven't the equivalent of a stack of low-cost, unassembled 1:18th plastic kits to draw spares from, I must instead search intently for parts from damaged models or those on hand for items that might be copied, modified and copied, or in some instances scratch built to suit my needs and to push my projects ahead. What is seen in the photograph is a series of open face molds as well as two-part urethane molds I've worked up consistent with creating needed supplies. Employing such, GMP Trans Am Camaro Hurst shifter assemblies can be reproduced (to later be vacuum plated unlike the standard GMP issue), a Hurst reverse lock out lever is seen (employed on the AAR 'Cuda's then), while further seen is a Shelby Collectibles GT 350R shift boot that will overlay vacuum plated resin plates with small divots ground into the corners to vaguely represent set screws. Positioned in the middle is a new one-piece mold for a GMP Trans Am Camaro seat mount that I hadn't done up until now. Also noticed will be the happy result of efforts to reproduce the signal light lenses specific to the race AAR 'Cudas and positioned on the roll cage main hoop positioned approximately two-thirds of the way up on either side. Tail lights from a 1:25th scale AMT 1968 Corvette which feature faint radial ribs across the surface and likewise come to a soft point as such were carefully cut out and isolated, whereupon the four I had were used to create the urethane mold seen on the far right. The mold was passed to a fellow scale enthusiast known for his quality 1:32nd scale period slot car windshield reproductions, who very kindly employed his methods to yield me extremely serviceable examples in clear resin. In particular, clear resin mixed and poured at room temperature typically clouds for very small bubbles remaining visible in the mix, while drawing the material into any mold often proves problematic. For much trial and error effort, heating both the resin as well as placing the mold or molds employed in a toaster over across hours can ameliorate the problem, and thankful I am to be able to lean upon those who've done the arduous work necessary to perfect the problem at a cottage industry-level. Though difficult to make out, the results are fine indeed and happy I am for his evident knowledge and skill - kind thanks to Brad in SE Michigan. Again, thank you each for looking in and contributing in a personally valued way. Those pit "signal" lights were front turn signals off 67-68 Mustang on the real car. I'm glad I was able to help with the Challenger seat pics and that they will help you make a better, more accurate model. I'm very impressed with the molds you are creating to make needed parts and the resin "glass" as well. Great job and thank you for keeping us informed. With how accurate your models are, I could see some reverse engineering a trans am car based on the pics of your models! Thanks Mike Camicia for the information and insight as to the 1:1 source of the light assemblies employed by AAR on the race 'Cuda roll hoops. In 1:18th the Greenlight '67 - '68 Mustang assemblies aren't quite usable thus, whereas the '67 -'68 AUTOart Mustangs are perhaps too expensive to even contemplate employing in such a fashion! On a longer-term 'to-do' list is to gather the full run of Popular Mechanics issues covering the 'Driving with Dan' column and question and answer forum published and found within select '67-'72 issues I do believe. One answer afforded across a '71 installment addressed the use of these signaling lamps, though I regret I haven't a copy of the text to reproduce here. Now for a brief divergence, this being a recent promotional model rehabilitation done in 1:25th scale. Here is seen a recent $8 antique store purchase originally painted in some goopy black enamel finish complete with lurid decals, Jo-Han Maverick promotional model wheels, plus scale rear slicks! Happily the awful paint finish fell away for delicate efforts made to strip the same, whereas given this Big Bad Orange example remained far from perfect (i.e. both A-pillars are twinged if you will), I thought I'd make a mild effort to create an unofficial Mark Donohue edition of what remained (see the adjoining period advertising image). A spare Jo-Han 1970 Mark Donohue Trans Am spoiler was added with white glue after painting the part with Tamiya aerosol - a fair match it seems. Noticed too will be the very acceptable Fred Cady '70 Javelin SST stripe work rarely seen applied. Mike, that Javelin turned out very nice for something you bought for $8 and had to strip. The stripes look great on it and the spoiler, wheels and tires look great too, although the Magnum 500 wheels could use some black to bring out the details. It's a shame you couldn't get the glass to fit better. 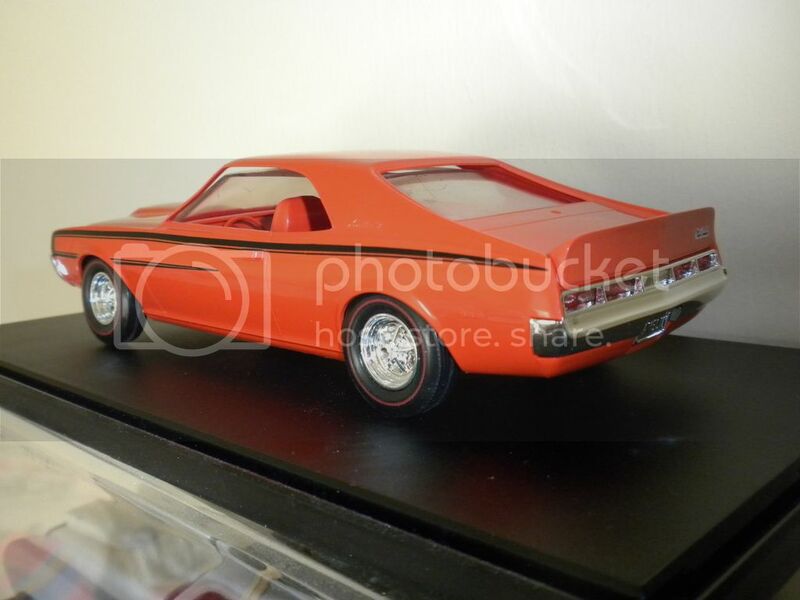 Your "what if" suggestions like a Group 44 '70 Challenger are intriguing to think about and a model of such a hypothetical machine is a great way to bring something like that to life. I can't see Tullius and Group 44 having any less luck than the other Mopars did in the '70 Trans-Am series. 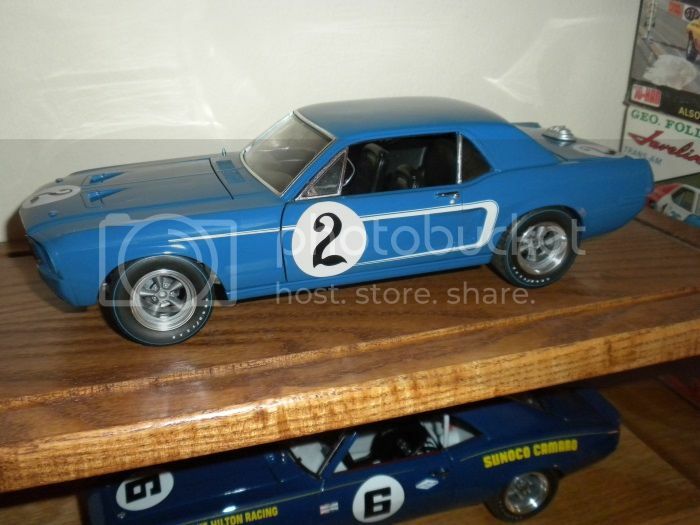 Although marketed as a 'Tribute Car' with few Trans Am-specific parts, ACME recently released a 1:18th diecast '68 Shelby Racing Co. corporate blue #2 Dan Gurney/(Horst Kwech) entry that is being sold new as this is written. The model isn't perfection for being less flares, etc., but all the same the exterior livery has been sensitively replicated and cleanly applied. In particular, I doubt I'd find the correct font style for the #2 reproduced accurately anywhere. 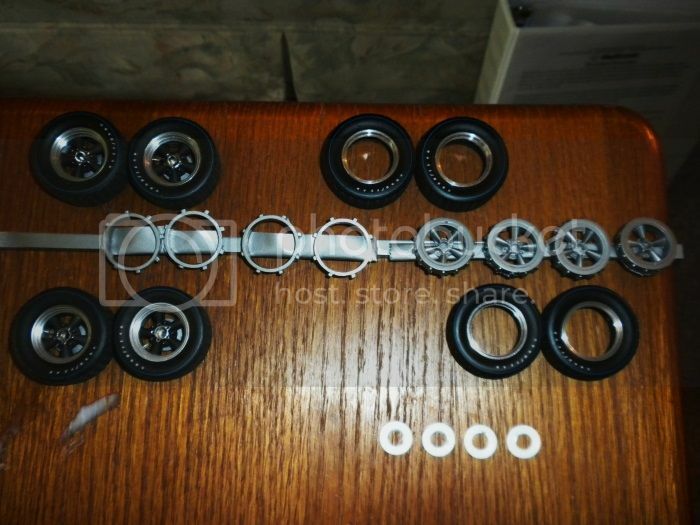 Seen below is a wheel and tire conversion recently performed consistent with making things appear more accurate. Very special thanks to 'Oldtimer' for his great generosity for which this project would not have been possible. ...the most recent release then. 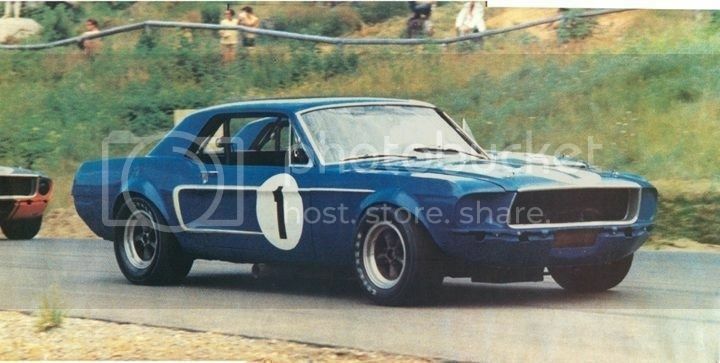 To my knowledge the mid-season livery change to Corporate Blue was never combined with the Daytona and Sebring-specific 'TA' class identification or ever featured 'Shelby Racing Co.' fender top identification - so off it came! Careful masking and acetone scrubbing accomplished with a fistful of cotton swabs made short work of these markings on the model seen below. ...Titus on the move in '68, perhaps at St. Jovite given the hilly terrain? ...oh, and why not a '68 Watkins Glen grid shot? You can kinda/sorta see #2 just behind #1 Titus. Wheels are ACME 1:18th '65 Dodge altered wheelbase American Torque Thrust rears cast in resin and mated to 1:25th Pegasus turned aluminum 22 inch 'barrels' cut down for use here as exterior wheel lips. Cast resin reproductions of the GMP 1:18th '67-'69 Penske Camaro wheels were used to mate the first two-thirds of each wheel assembly to the old GMP Trans Am tires seen employed here, whereas hub and mounting material was likewise recycled from the old GMP Trans Am wheel and tire set to attach each to the model chassis proper. The resin GMP brake discs seen here were not used, but rather replaced with chromed washers picked up at a big box hardware store. ...although basic at this point, '68 specific headlamp fill panels have been fitted, ride height has been altered as well as track, a fuel cell housing has been fitted, whereas a modified GMP fuel cell inlet has been added to the deck lid.